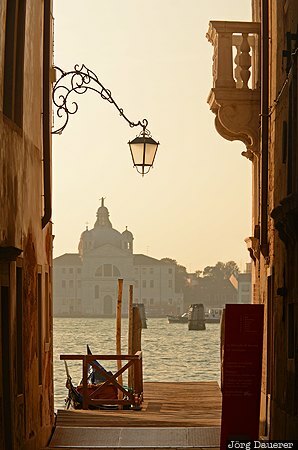 A lone street lamp between the facades of two buildings in Venice with the silhouette of the church Santa Maria della Salute in the background illuminated by warm morning light. Venice is in Veneto in northern Italy. This photo was taken in the morning of a sunny day in October of 2011. This photo was taken with a digital camera.